Today i wanted to talk about MAC lippies. I made a cheeky purchase in the airport on my way to Majorca. And as I have been obsessed with Velvet Teddy and Whirl, I thought it's time to move on for now and get something more appropriate for spring and summer. I've always wanted to try MAC lipglosses and see if the quality and longevity is better than drugstore products. I picked up MAC Lipglass in SNOB. MAC describes it as light neutral pink. It has a milkier, paler appearance so I am not sure how well it would work with darker skin tones. If applied too much this lip gloss can leave white line inside your lips, which we all know is not very attractive look. It makes my lips look super plumped and juicy. The longevity is not a miracle, but you can get few hours wear of it, after that colour fades and lips looks kind of wet. It is very moisturising and wears comfortably, consistency is very thick so you need to make an effort applying and blending the colour, otherwise it ends up looking patchy and uneven. Overall, I really like this MAC Lipglass, I think its perfect in spring and summer for effortless, natural look. Next I've picked up MAC Cremesheen lipstick in MODESTY. It is described as muted neutral pink. I am obsessed with this lipstick right now! It is so easy to wear and goes with pretty much all make up looks. 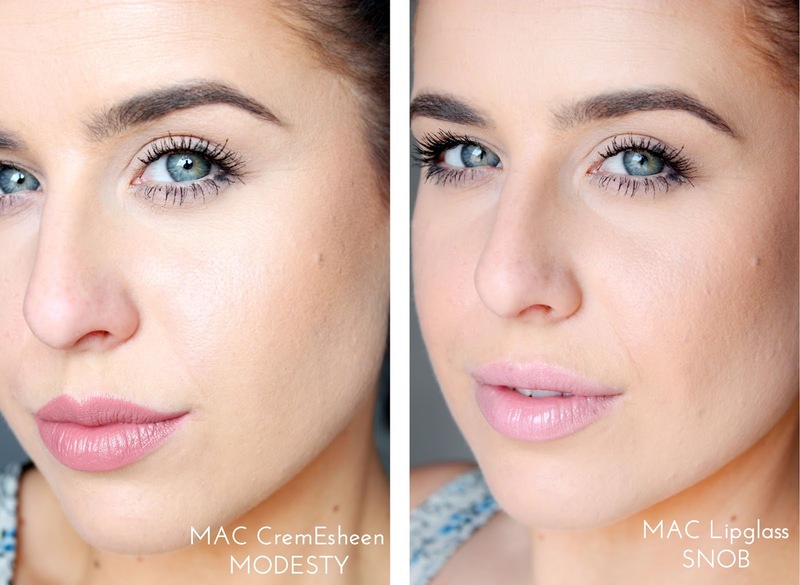 MODESTY is amazing if you are after very natural looking lips, it's one of those 'my lips, but better' shades. Cremesheen formula leaves sultry shine on your lips. It is incredibly comfortable to wear and stays for ages on my lips! I am super happy I picked up this shade. I think it would look great on a lot of skin tones. Highly recommend checking it out. Let me know your favourite lip products for spring and summer.